At work one Saturday morning last year. 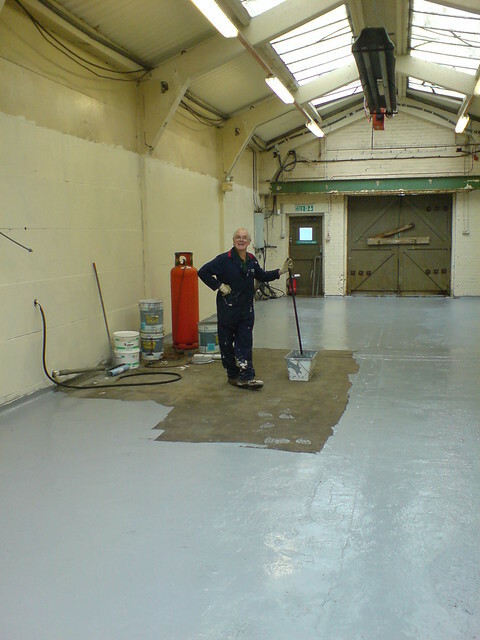 They gave this guy the job of painting a workshop floor, before I moved some machinery in on the Monday. Went in to check how he was doing. Yes, this is a genuine photo, no edits or photoshop. Shall we take a poll? He's missed the top of the wall's as well. I had a mate who did a similar thing with wax floor polish, it was extremely funny watching him trying to escape. The beauty of Not Planning, is that failure comes as a Complete Suprise and is Not preceded by a period of worry and depression. He had already checked out the gantry crane, and had a plan?